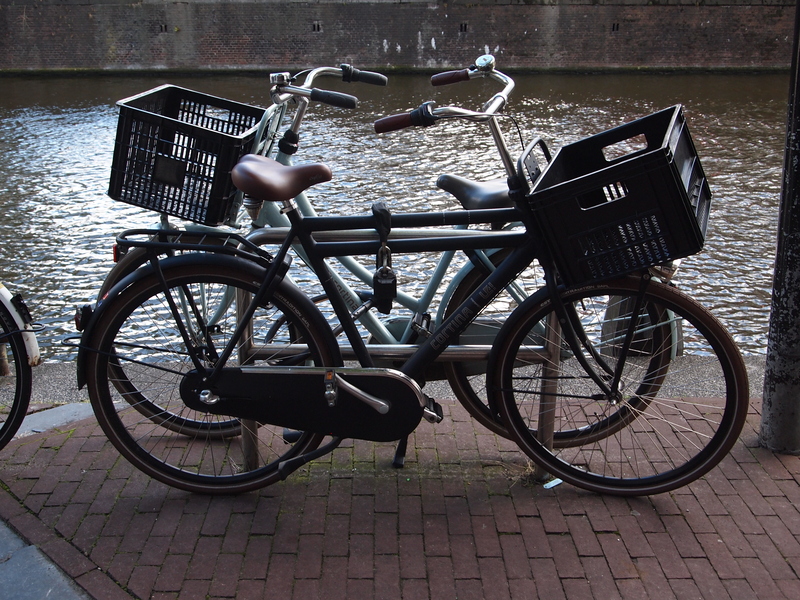 Two bicycles in Amsterdam securely locked. Today I thankfully have a snippet of time to sit down and write. Since the start of September I have been working, cycling around and worked some more. Student life is definitely over for me. I mentioned “cycling around” and that has a reason. I work in the Amsterdam region and the quickest way to get from A to B often is by bicycle. It is a Dutch thing to cycle when you can until you need a car. Cycling comes with its pleasantness and unpleasantness. Dutch cyclists, especially in the more populated cities can be terrifying or friendly or somewhere in between. Go to Amsterdam or Utrecht and you know what I mean. Dutch law, more specifically traffic law defines combustion engined vehicles as more dangerous than vehicles without. That way every driver of a car, van, track, motor cycle and certain mopeds keep an extra eye on people on foot and cyclists. Thing is, cyclists can attain pretty high speeds on pretty spare, flimsy frames and thin tires. Bicycles in general are light framed, two-wheeled, chain-driven nimble things on thin tires with just enough grip. In regions with smaller spaces and narrow paths they are ideal for racing through the environment. It makes the person riding the bicycle as nimble as a mountain goat on any surface. Keep the load light and do not fall down and you are fine. With or without gears, the rider uses the legs to accelerate, maintain speed and decelerate. You are in control. That nimble two-wheeler does not offer protection. At all times you are avoiding collisions and you are never entirely stable so you continue to bike or stand still. In some neighbourhoods and cities a newish looking bicycle is a prey for thieves. Always double lock, preferably to a pole or fence. Some cyclist are terrifying idiots who have no manners so watch out. As a Dutch cyclist my advice is simple: watch left and right, keep eye contact with the surrounding traffic (especially cyclists) and initiate your direction to be noticed. Posted in Short Reads and tagged 03-10-2015, advice, Amsterdam, bicycles, biker, break the rules, chaos, cities, collisions, control, cyclists, Dutch, flimsy, live and let live, nimble, pleasantness, protection, skip cues, to cycle, traffic, unpleasantness, Utrecht, watch out on October 3, 2015 by rura88.